American Punch manufactures a full line of stock leaf spring tooling, including taper punches, die buttons, coupling nuts, sleeves and stems. Our made-to-order spring leaf tooling runs the gamut from cupping and nibbing tools to eye and wrapper mandrels, shear blades, trim blades and scarfing blades. Contact us today for help with the leaf spring tooling you need. 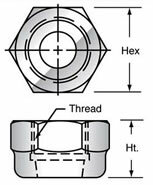 A = 11/16" S = 9/32 - 15/32"
A = 13/16" S = 1/2 - 19/32"
A = 1-1/4" S = 5/8 - 1-1/32"
S-11 sleeve punch size: 9/32 - 15/32"
S-13 sleeve punch size: 1/2 - 19/32"